Like Google Apps, Zoho Wiki is an online platform that allows multiple users to collaborate. Rather than having your staff and volunteers communicate via email with multiple drafts and file versions, Zoho Wiki provides a centralized place to store information in an organized, tiered structure. Your wiki acts as a hub from which you can create webpages for your website, collaborate with anyone, manage your website, and share information with whomever you wish. Your wiki can be shared with just your organization, a group of people you select, or with the general public. 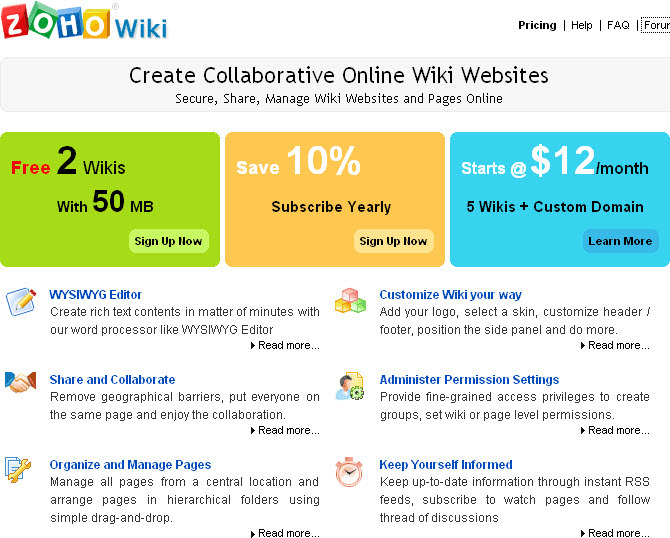 A “wiki” is a website that allows users to easily create and edit any number of interlinked webpages. Users create and edit pages via a web browser using a simple “WYSIWYG,” (or “what you see is what you get”) text editor. Powered by special software, wiki platforms are often used to create collaborative websites, to power community websites (e.g., for a nonprofit), or as knowledge management systems. The most famous wiki is probably Wikipedia, the online, user-generated encyclopedia. Zoho Wiki lets you build organized sources of information in a centralized place. Zoho Wiki can be used by anyone, for any purpose. For nonprofits, Zoho Wiki is a great way to put together your thoughts, brainstorm, and share valuable information with other members of your group. You can host photos, post agendas for your events, and organize event schedules for your staff and volunteers. Using links, you can hierarchically arrange (in a folder structure) and tag your pages, which aids in fast and easy navigation. Tagging pages is an effective way to provide detailed data for your site visitors. By adding a tag (a keyword that describes the content on a particular page), you can quickly filter and categorize information. Tagging also provides an easy way to search for relevant content. With Zoho’s “SiteMap,” you can reorder pages and subpages using a simple drag-and-drop function. You can also alphabetically index all webpages in your wiki, and create a table of contents to build sections for your site. Zoho Wiki makes monitoring site changes simple. As with Google Apps, Zoho Wiki allows you to administer permission settings, so you have full control over who can create or manage groups, edit pages, read pages, or customize the look of the site. Additionally, users can create their own “watch lists” of pages or wikis, which means they will be notified every time that page is updated. Users can also keep track of changes made, including who edited the page, what file versions were attached, and when it was done. They can also view comments and revert back to a previous page version, if necessary. Report card: Zoho Wiki is great for organizing information, but requires a higher level of technical skill. Zoho Wiki is a great tool for creating an organized page structure with multiple “layers.” Zoho offers other products and services (such as Zoho Meeting, a tool for web conferencing) that interact with each other. In fact, Zoho is useful even if you already use Google Apps. “Zoho for Google Apps” integration means you can log into Zoho with your Google name and password, access Gmail, Google Docs, and Google Calendar from inside Zoho, and embed Zoho Projects in Google Sites. If some of that sounds overwhelming to you, then you’ll understand why Zoho Wiki’s key drawback is that it requires greater technical skill. For both administrators and users, Zoho Wiki is rated as fairly complex to use. If you want to implement Zoho tools in your organization, consider whether your staff and volunteers are tech-savvy enough to easily adapt to it, or whether someone has experience with wikis and could help train others. Security is low on Zoho Wiki. You can set permissions for who can edit and view certain pages, but you should not post confidential information here. Zoho Wiki provides two wikis and 50MB of storage space for free. For $12 a month, you get five wikis and 250MB of storage, and pricing packages go up from there. Nonprofits receive a 15% discount. To get started, visit http://wiki.zoho.com. To explore Zoho for Google Apps, visit http://www.zoho.com/google-apps/index.html.